For a chance to win this dress, leave a comment. For a second chance, leave a comment telling me you are a follower (but only if you are, of course). I hate being the first commenter, but I want to win these fat quarters! Wow!! I love these too! I wonder if I looked close enough if I would see some I have. :) This is a most fabulous package! i am willing to win this now! Love the vintage choices, they are so cute!! These look great! Thanks for the chance to win. I'm a follower and would love to win. These are gorgeous, I'd love to win! Wow I LOVE these. I'd love to win! I love the vintage feel of these sheets. Would love to win these fat quarters! I LOVE vintage sheets, but I can never seem to find nice ones around here! This is fantastic! Thanks for the giveaway! I love vintage sheets! Thanks for the chance to win! some of these remind me of sheets from my childhood! too bad i didn't ask my mom to save them! great giveaway! Wow! I love the colors. Can I be lucky ? These are great. Thanks for the chance to win. Wow! This one is awesome too! I would love to win those fat quarters! Thanks for the giveaways! Wow! This would be the way to get a stash for a quilt! Just what I need to get me quilting! I have not seen such a nice variety on vintage sheets in one place before! They would be wonderful for little projects. count me as one of your fans! ...and I'm a happy follower! oh, vintage linens have become a new love of mine, so please enter me in your generous giveaway ! thanks !!! I've recently gotten into vintage fabrics and linens. These are great! neat. what a collection of fqs! love this collection of prints! I would love to win these...they'd make a great quilt! Oh, me please! Love your blog! That's a whole lot of vintage goodness! Thanks for the giveaway! oh i love those vintage sheets! thanks for the amazing giveaways. I would love to incorporate these into a quilt that I am rehabilitating for my mother! I love vintage sheets! Thanks for the giveaway. lovely vintage sheets! Thanks for the chance to win! And I'm a follower in my google reader!!! These are AWESOME! I love vintage sheets! Fat quarters are the perfect size for making simple skirts for my girls. I am IN LOVE with these! My mouth is watering, is that normal? I LOVE sheets for sewing and I LOVE anything vintage. Ohh wait I am dooling!!! Mmmm, I spot a sheet in the front that I had when I was little!! Does that mean I am vintage??? Ha, ha!!! I love these colors and prints! Ooooooo! Vintage sheets! I want them. Oh yeah, I am a follower. Ohh I've been wanting some vintage sheets. These are so nice. Please, please! I need some vintage fabric. This is fantastic. I'm a follower too and I love the SYTYCQ contest. These beauties would make a perfect summer quilt for my bed. Thanks for the chance! I love all these vintage sheets. What a great way to start my collection. i really love these. You're totally awesome for doing more than one giveaway! Wow! these would a fabulous addition to my collection!! Wow! Thank you ever so much for having such a wonderful and generous giveaway! I love vintage sheets (and vintage fabrics in general too) so it's super to have a chance to win such a gorgeous selection. Would love to have some of this pretty fabric! Thanks for the giveaway. i'm in the swap & would love to add even more since both of my girls want to make quilts with the sheet! Wow, That is one amazing collection of vintage, I am in love! Vintage sheets! Wow. I am blown away by your generosity. These are so beautiful. Been following for a while. Thanks for the chance to win. I'm doing a vintage sheet fq giveaway over on my blog too but I'd love to add these to my collection for a quilt I'm making for my daughter! Come on lucky random number generator! i've recently started collecting vintage sheets...what a great way to quickly add to my collection. :) thank you! I am so in love with vintage. Lovely! Oh, all the vintage yumminess! *a new follower as well! These would make a lovely picnic quilt! Vintage sheets! I love them. 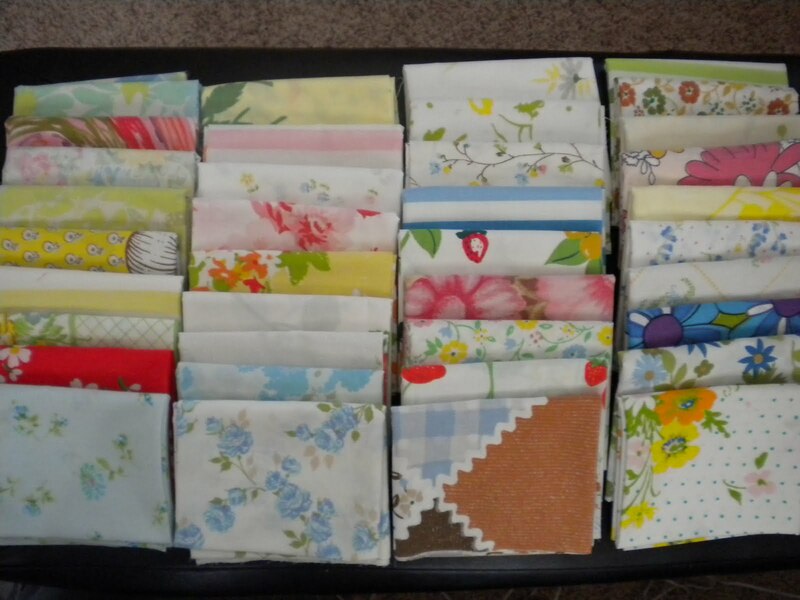 I would love to win these to make a quilt out of vintage sheets. You have collected quite a nice set. Wow! These are great! You really found some beautiful ones. Thanks for a great giveaway! I love fat quarters. So much you can do with them. All these giveaways you have are so wonderful! Wow! Lovely giveaway, just love those vintage sheet fat quarters! Such great patterns! I have got to start collecting vintage sheets. This would be a great start! Where did you find all those lovely sheets? I can never find ones at the thrift stores around here! I would just love this. Lovely giveaway! I hope I win! I'm pretty sure my gramma had some of those! What sweet prints! I'd love to enter this give-away. Love these! Thanks for a great giveaway! Those are some lovely patterns, and all from sheets?! Amazing! Wow! I love vintage sheets. I see a couple in this group that I have. I am in a quilting bee devoted to vintage sheets. Thanks for the chance to win. Those are so pretty - please enter me! Looks like enough vintage linens to finish up my string quilt. Thank you for the generous giveaway! I have been looking for a way to start a vintage collection...this would be perfect! How neat! I love vintage sheets! 37 vintage FQs? Yes! YES! YESSSS! Count me in! !